Got around to taking some pictures from the potato camera on my iphone! It looks even whiter in person. Now I just have to wait for my gmk white on black icon mods to come in, and the hopes that I find a way to snag a Jelly key- black final frontier spacebar in the aftermarket! I just sent out another group of packages, most international. The international shipping is costing more than I anticipated. I set a price and stand by it, so I'm going to go ahead and ship everyone's, but I'm following up with a request to help pay the difference, if possible. I should have charged $25 for international shipping instead of $15 because I'm sending it boxed overseas. I hope this isn't an issue for anyone. I'm in Canada, not overseas, but if it's going to cost more to ship here, I'm happy to pay the extra. I based my prices off of shipping to Canada (which was a mistake). It costs $15.50 to send to Canada, so I'm not asking extra from my northern brethren. MaNiFeX is the organizer of this group buy and is shipping all the group buy orders by himself. 1upkeyboards is a different entity that bought 10 or so sets, already received them, and is now selling/shipping their sets. The updates you see above from MaNiFeX about shipping times has nothing to do with them. That is correct. skiwithpete ordered sets early (and helped get the group buy going!) and got his in the first round of shipping. Since he runs a store, he bought at group buy prices and sold to others with after-market prices. He's probably the only one making money off this. I'm doing this at a loss and am getting through shipping as I can. One person sending out 150 sets takes some time, especially since this is a hobby for me. I'm also a single dad of two young girls, work full time, and have the holidays to prepare for. I'm doing my best, and apologize to those that have to wait a little bit to get theirs. Just know that you got them at cost, so waiting is the price for that. This is also my first group buy and is why I'm being very transparent with the process. Please know that you will get your set. I'm hoping to do another round of domestic shipping this week. It took me over an hour at the post office to send out 5 international packages (I have to fill out a customs form that the post office then has to type out), so those are taking me a little longer to get through. Thanks to all members for making this set a reality. I appreciate your patience as I continue to process, pack, and ship all the orders. My goal is to have everyone shipped by the end of January and close out the Group Buy in February. I sent $5 to help. I've received some amazing messages of support and I can't thank the community enough. I've put all my keyboard stuff on hold for this project and am really glad you all appreciate the work I'm doing. I don't mean to get too personal here, but the past 5/6 years have been a big struggle for me, in general. Please don't see this as some sort of plea for anything; I just want to give you some context for what brought me to the community and do the group buy. My life was good. Despite my parents divorcing at 16, I made it into and graduated from a competitive college (Macalester) and left with a fiancée. I moved across the country to Portland, got married at 22, bought my first house at 24, had kids at 25 and 28. Things were going well until my kid's mom decided being married to me wasn't what she wanted anymore. I did my best to save the marriage, but it didn't work out. I went through a divorce 5 years ago (I'm 36 now) and was asked to leave my home on Christmas while celebrating with my wife and girls. We were separated for six months and I thought my ex was moving in to the home to work on our relationship, but she just wanted the house, apparently. That's life, though. I didn't want to be a guest in my own home, so I left, went through mental breakdown, and almost lost my job on top of it all. Finding the community on /r/mechanicalkeyboards and geek hack gave me something to enjoy again. The hobby is a really cool one and has gotten me interested in something healthy and not destructive. After getting burned by to the tune of $250 last year on Ivan's buy, this group buy was my way of trying to give back to the community and restore faith in the group buy process. That's why I set the prices so low and did my best to see this come to fruition. I can't thank everyone enough. Despite shipping 150 sets being a bit stressful, every time I ship out, I feel that much better. I can't wait to feel the accomplishment of finishing this group buy. Thank you all for participating and giving me something to feel good about. It means the world to me. I'll keep shipping and posting. Let's finish off 2016 on the positive, OK? Thanks again for all your support. You all rock! That is correct. skiwithpete ordered sets early (and helped get the group buy going!) and got his in the first round of shipping. Since he runs a store, he bought at group buy prices and sold to others with after-market prices. I managed to secure the last remaining one . So my whiny spamming paid off! Though I did not participate in the original GB, thank you for organising it! This set should be easily combinable with most mod/add-on packs like CMY*/RGB* which makes it quite awesome for me. Despite shipping 150 sets being a bit stressful, every time I ship out, I feel that much better. That's 150 people across the country/world using something you made happen! Thank you! It will feel good. I did see the first version of your post. I want to say, that even though I went through a tough divorce, I still can love/trust someone else and try not to harbor ill-will towards my kids' mom - she has a right to live her own life. I wouldn't be the person I am today without going through my struggles and I am a better person because of it. Yes it hurts, yes I lost a lot, but I'm persevering and rebuilding bit by bit. I was just trying to illustrate how the community gave me something when I had very little to be happy about and that I wanted to give back. Thanks all for your support and patience as I work on the group buy. Hopefully, it got me off the naughty list. Thanks for making it happen! All your hard work is going to pay off when you ship that last package. May the force be with you! You bet! To be fair, the color-way was named by the community, I just went with the theme. I'm a big Star Wars guy, too, so I figured why not?! You guys are awesome. It's going to be a snow day here in Portland, so I will probably have some time to pack up another round for shipping. "GMK Dark68" - 68% and less. Dark grey mods, light grey alphas, black legends. 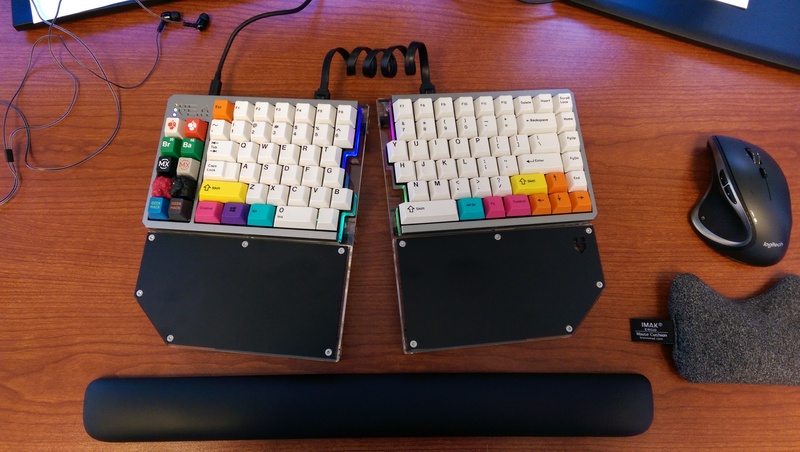 Supports 68% and less (no F-Row or numpad but has nav cluster), including: ortho, split space, win keyless/HHKB. Trying to keep my sets around or under $100, still. Might have to team up with originative/massdrop/1up/keyclack/etc. for shipping. What do you think? Definitely depends on the shades of grey. Also, if the alphas were dark enough, we could mix it with Stormtrooper and recreate the Commodore PC-10. Image from Deskthority and originally posted by Findecanor. Was definitely intentional, I wanted this to be a good deal/experience after losing so much on Miami Nights. Thank you so much. It means the world to me. Maybe I'm too hard on myself, but I don't feel like I'm keeping up. I'm juggling a lot this time of year. Your guys' support is really great for the buy. Despite working from home yesterday, work was very busy, but I'm going to put in some time this weekend to ship out the next batch. Thanks for being patient, all! I can't believe it's not gravy! Just another chimer-inner: You rock, MaNiFeX. Gosh guys. Wow. I didn't realize I'd have this much support! That's exactly what I was going for, but I want the mods to be Dolch Dark with black legends instead of white. OK, got all my christmas shopping done (WHAAAAAT?!). My girlfriend must be a good influence on me. Going to pack up some more tonight and ship out tomorrow. If anyone had any issues with shipment, please let me know, I want to make sure my processing is solid. I'm a bit afraid that Dolch modifier colours (N9) might be a little too dark to effectively use with black legends. I think maybe something like light grey on N9 would be better? There are a lot of sets coming on the horizon that also uses N9 mods (Sky Dolch, Terminal), so having something neutral enables very exciting opportunities for mixing and matching. Also, just to join in the chorus, I think you've been doing an exemplar job with this GB in terms of overall communication, and you have my total support for future GBs. Thanks guys. Got my Christmas shopping done. Hope to get a good batch out Monday. Sorry I didn't make it before Rogue One for you all! No worries here, got my stormtrooper fix this morning seeing it in IMAX. Thanks for putting this whole thing together! Phwew! Work week is done, my mom made it into town, I've got my two elves to help out! Santa is going into his workshop. More progress on the shipping to come. Happy Holidays! Received mine (via 1UP) - thanks! Ho Ho Ho My! What a great look with the RGB! I would honestly not mind if you didn't spend time shipping it over the holiday season and spend time with your family and resume in January instead. Seconded on that. Enjoy the important things. Us nerds will be happy to get more GMK caps any time of the year. Merry Christmas Matthew and you all! OK, my kids go to their mom's on the 26th and my mom leaves the 28th. I'll start packing and shipping after that. I ended up getting some extra vacation time this year, so I might take a day or two off after that to just finish everything off! Thanks for understanding, I really wanted to get these out to you before the new year, but work, life, family, etc. can get in the way of our hobby. Thank you for understanding!!! Hot damn that looks nice. Doing some packing this weekend. Will be shipping out Tue/Wed next week, most likely. Enjoy the new year! Mimicking the stock whitefox colorways with sky dolch accents. Damn that's lovely. 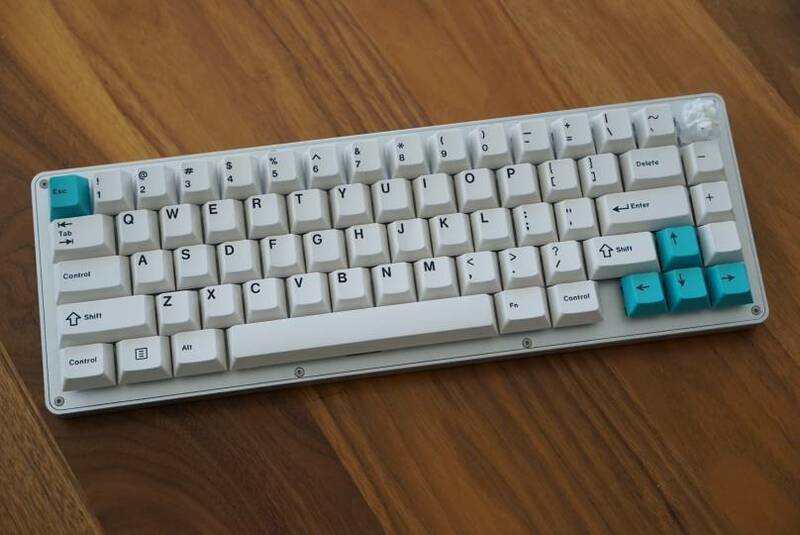 I love the clean look of the default Whitefox but this is even nicer. Is it still possible to grab a set? here's the VE.A i just finished. stormtrooper provided quite a stark contrast to the accent keys. more color than i typically have on my boards, but its fun! I will as I ship. I'm going to be shipping more out soon. Sorry for the delay, my daughters started their ski season and I'm just getting back to the project. Thank you all for your patience, I promise you will get your caps sooner than later! Hoping to finish this up in the next few weeks/month. In other news, I'm going to ask my girlfriend to marry me. She's amazingly awesome and loves my kids. My kids love her back. Despite some of my personal struggles in the past, I'm really looking forward to spending my life with her. Thank you all for supporting me. I've felt really bad about not shipping recently, but life happens. Hope she says yes! Ideally, she would say yes contingent on you shipping out the rest of the caps. Dude, this is awesome, congratulations!! Diamonds >> white plastic... always! When you find that one who can put up with your various neuroses and past transgressions and all that, it's truly awesome. I always cringe when I hear people talk about their "ball and chain," etc. I am coming up on nine years married (+ three kids) and it's been by FAR the best thing ever to happen to me. When it's right, it's so so good and I'm happy for you both for finding each other! Page created in 0.132 seconds with 84 queries.